DHL: From Startup to Global Upstart is the story of a startup that became the first worldwide logistics service organization, fighting regulation, trade restrictions, customs, and many other technical issues to develop processes that have stood the test of time to become the accepted norm in delivery throughout the world. It is a story of using "soft powers," persuasion, and ingenuity, working with, and around, emerging technologies to eliminate barriers to success. 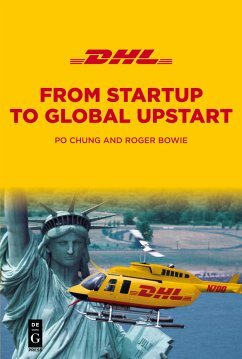 This book provides an extraordinary look into how a little startup with grit and perseverance succeeded in the face of overwhelming odds and revolutionized many of what are now accepted transportation and supply chain practices. Po Chung, DHL International co-founder, and Roger Bowie, former DHL Worldwide Services Director, discuss how DHL paved the way for one day international package delivery and how they have maintained their global leadership position against powerful American titans.